West Virginia. Oklahoma. Arizona. Colorado. Since March, there’s been a teacher walkout in each of these states. Each of these walkouts is a moment, and the challenge is how to make the issues at their core endure, to make them movements capable of changing the education landscape for future generations. Amber England is a consultant for the Oklahoma Education Association. Before that, she was Executive Director at Stand for Children Oklahoma. She and I met at the Oklahoma Capitol back in 2009 while working to ban trans fats in all school meals. You might think we immediately connected over our passion for health and wellness, but it was the fire inside Amber that I recognized. She is a smart, fearless #firestarter who doesn’t mind standing for an issue even if it means standing alone. It’s been incredible to hear about her work around education funding in Oklahoma, an issue she’s poured her heart and soul into for 15 years now. Amber sat down with me recently to share her key takeaways from movement-building in Oklahoma. Movement Makers, these are great tips for turning your passion into something much, much bigger. Education funding is a deeply personal issue for Amber because education lifted her family out of poverty. “Education is the most powerful weapon we have to change the world,” says Amber. “I know that because it changed my own life. It saved my family.” At the time of her parents’ divorce, Amber’s mom had never worked outside the home and had no formal education beyond high school. She went back to school and became a teacher. For Amber, the fight for education in Oklahoma honors all the incredible members of school communities—people like Amber’s mom—who change lives every single day. “They aren’t glorified as heroes the way an airplane pilot that saves lives is, or a first responder, but that doesn’t change the fact that teachers and school support staff are heroes that change and save lives every day.” I get it because my own mother was an educator. She was the first person who went to college in her family, and as a teacher and school principal in Lafayette, LA, she had an incredible impact. But Amber’s journey –and the journey of concerned parents and the Oklahoma education community—to reshape education in the state began long before April 2. The fight for education funding in Oklahoma started 6 years ago in 2012 when a group of concerned parents came together in Tulsa to form a group called 49thIs Not Okay! At the time, Oklahoma ranked 49thfor student expenditures. The group organized rallies, protested at the Capitol, and began reaching out to like-minded community members and organizations. The next year, education groups from across the state came together and held the largest-ever rally for public education. 20,000 people attended, but lawmakers just patted them on the back and otherwise ignored them. Defeat #1. 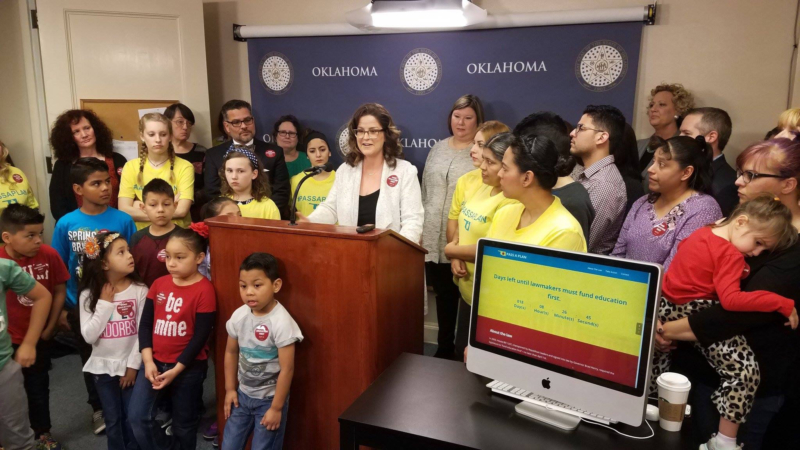 Under Amber’s direction, Stand for Children decided it was time to take on incumbents and hammered home the message that these legislators had made terrible budget choices and it was the children of Oklahoma who were footing the bill, so to speak. But those legislators were still re-elected. Defeat #2. Then, in 2015, Stand for Children filed a constitutional ballot measure that would have increased the state sales tax by 1% in order to fund education. But despite polling at 63% in favor of the ballot measure, it still failed. Defeat #3. At this point, having faced what seems like three big failures, most people, and most moments would be crushed. But not these education crusaders, not Amber. “You have to have incredible persistence and patience to be successful building a movement. Change doesn’t happen overnight. It’s about continuously moving people up a ladder of engagement and getting them comfortable with bolder and bolder action. Part of that is accepting failure: never giving up no matter how many times you fail.” And while these were, undoubtedly, defeats, each one was successful in deepening engagement and shifting the narrative on education. As a result, more and more people began realizing that the legislature was letting down the children of Oklahoma. Those defeats ultimately set the stage for a successful walkout. Takeaway #1: persist, persist, persist. Failures are actually stepping stones towards your first big success. Takeaway #2: Recognize when you’ve got a successful moment on your hands and harness that energy. Moment after moment after moment and you’ve got the beginnings of a movement. And the energy certainly seems to be building. A record number of teachers have filed to run for office. A series of town halls have been organized across the state. Educators and their allies are making sure the conversation continues. This is what the work is about: paving a way for those who come behind you to have a better tomorrow. Takeaway #3: Do not go quietly into the night by thinking the work is finished. Continue to make noise and people will have no choice but to listen. The teachers in Oklahoma continue to train others who will help them with their efforts. They are strategizing how they might amplify their message. With the mid-term elections around the corner, this will keep the pressure on politicians and allow their issue to become part of campaign debates. These #firestarters aren’t just teaching students. They are teaching us how to fight for what we believe in and aren’t ready to quit fighting. I can’t wait to see what happens in the Sooner State.